2013 Hurricane Season Forecast: "Active"
On June 1st, the National Hurricane Center station WX4NHC was activated for its annual on-the-air live event to test radio equipment, antennas and computers for the 2013 hurricane season. "As part of our test, we operated on most of the modes that are available to us at WX4NHC, including HF phone and CW, HF/VHF APRS, EchoLink/IRLP, VHF/UHF simplex and local repeaters, and received reports via our on-line Hurricane Report form and email," reported Julio Ripoll, WD4R, WX4NHC Amateur Radio Assistant Coordinator. "All of our radios, seven antennas and two dedicated computers tested well. Although the HF propagation in the morning was very poor due to a solar storm, operators managed to make contacts with many states, Caribbean Islands and South America, mainly on 20 meters." successful, with over 100 contacts made. 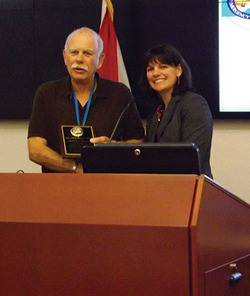 "We made a special direct contact, the first that I can remember, with Bob Robichaud, VE1MBR, at the Canadian Hurricane Center," Ripoll said. Amateur Radio station WX4NHC has been a permanent part of NHC for 33 years and has 30 dedicated volunteer operators that operate the station in shifts during hurricane situations in the Atlantic, Caribbean, Gulf and East Pacific. The National Traffic System Digital (NTSD) consists of a group of fully automated store and forward bulletin board systems known as Mail Box Operations (MBO) or hubs operating on HF using high speed Pactor 3 protocols on a 24/7 basis moving formal message traffic. The goal of NTSD is to move that traffic via digital means to the closest point of delivery at which point it is then removed from the automated system by operators known as Digital Relay Stations (DRS). The DRS then take this traffic to the manual NTS system via the nets at region, section, and local levels for any additional necessary relay and ultimate delivery. There were a total of 12,425 pieces of message traffic handled by Eastern (eastern portion of the United States) Area NTSD during May. This was accomplished by 8 automated MBO stations representing NTS regions 1, 2, 3, 4, and 8 and a total of 39 individual Digital Relay Stations reporting at regional, section, or local NTS levels. A similar level of activity for May also existed in both the Central and Pacific Areas of NTSD. Georgia Emergency Management Agency (GEMA) and the Federal Emergency Management Agency (FEMA), conducted a test deployment of Mobile Command Vehicles (MCV) during the week of May 13 through May 16, 2013. The test at Stone Mountain Park, Stone Mountain, Georgia, was to demonstrate and examine the capabilities of the MCV's. ARES was called upon to test its capabilities during field operations there. The Georgia Statewide ARES HF Net was called into special sessions on Tuesday, May 14, from 9 AM until 5 PM, and on Wednesday, May 15, from 8 AM until 5 PM. A net was called each hour during the day for check-ins and traffic. Several different Net Control Stations were used and tested. A special session of the Georgia State Net (GSN) was called at 10:30 AM on Tuesday, on 3549 KHz medium speed CW with a special session of the Georgia Digital PSK31 Net called on Wednesday, on 3583 KHz at 10:30 AM. Other special nets were called as needed. In addition to the statewide HF Nets, Georgia D-STAR and Georgia WINLINK 2000 systems were active. Several repeaters in the metro Atlanta area were also active in support of these operations. All ARES operators and groups were encouraged to participate in this drill to demonstrate the capabilities of Amateur Radio. Professional storm chasers Tim Samaras, WJ0G, his son Paul Samaras and fellow investigator Carl Young were killed on May 31 near El Reno, Oklahoma when an EF5 tornado suddenly changed paths and slammed into their vehicle; they were unable to escape. According to ABC News, Tim Samaras -- an ARRL member -- was found dead in his car, still in his seat belt; Paul Samaras and Young were pulled from the car by the tornado; one of the men was found a half-mile away. National Geographic Society Vice President for Research, Conservation and Exploration John Francis told The Washington Post that he fears that there are too many people jamming the roadways in pursuit of twisters and that this might have contributed to Friday's fatalities. In a May 2013 online interview with National Geographic, Samaras told of the increase in the number of storm chasers in recent years. "There's lots and lots of storm chasers out there, but you can probably count on one hand the number of people who go out into the field and collect data from tornadoes," he said. "We run into [storm chasers] all the time. On a big tornado day in Oklahoma, you can have hundreds of storm chasers lined up down the road. Oklahoma is considered the Mecca of storm chasing. We know ahead of time when we chase in Oklahoma, there's going to be a traffic jam." The Samarases and Young were with TWISTEX (Tactical Weather Instrumented Sampling in/near Tornadoes EXperiment), a scientific field research program founded by Tim Samaras to "better understand tornadogenesis, maintenance and decay processes and to gain insight and knowledge of the seldom sampled near-surface internal tornado environment." The TWISTEX team has been featured on The Discovery Channel's Storm Chasers. Tim Samaras holds the Guinness World Record for recording the greatest pressure drop ever measured inside a tornado (100 millibars near Manchester, South Dakota on June 24, 2003) and is the only person to ever record video from inside a tornado. In his biography on The Weather Channel's website, Tim Samaras said that he used Amateur Radio equipment when he chased storms. "Being that we are on a scientific mission," he explained, "we carry about 8-10 probes, along with other weather instruments, cameras, laptops, GPS navigation, cellular telephone, ham radio equipment (I'm a ham radio operator), first aid kit -- in case we come across tornado victims (most of our crew is first aid trained), tools, winches, saws...well...the whole garage." The ARRL National Traffic System (NTS) routinely passes practice messages to help operators build and maintain their traffic-handling skills. One way to create such messages is to solicit them from the public at preparedness fairs, exhibit booths and, of course, Field Day. Click here to download a pre-formatted message form that's guaranteed to make this process as smooth as possible. Print as many copies as you need and put them on display along with a sign inviting visitors to send a message. Disaster preparedness for individuals and families includes having out-of-state contacts that can be notified in case of an emergency. When curious visitors approach the table, explain the importance of having such information. Be sure to emphasize the fact that in a real incident Amateur radio may be the best way to reach their designated contacts. The message form is easy to use. Your "intake" person simply inserts the addressee and sender information from the visitor and passes the completed form to the NTS operator, who adds the appropriate header information and sends the message on a regular traffic net. Forecasters with the National Oceanic and Atmospheric Administration (NOAA) are calling for an "active or extremely active" 2013 Atlantic hurricane season. In its initial outlook for the 2013 Atlantic hurricane season -- which begins June 1 and runs through November 30 -- NOAA's Climate Prediction Center is forecasting a 70 percent likelihood of 13-20 named storms (winds of 39 miles per hour or higher), of which 7-11 could become hurricanes (winds of 74 miles per hour or higher), including 3 to 6 major hurricanes (Category 3, 4 or 5 with winds of 111 miles per hour or higher). These ranges are well above the seasonal average of 12 named storms, 6 hurricanes and 3 major hurricanes. "With the devastation of [Hurricane] Sandy fresh in our minds, and another active season predicted, everyone at NOAA is committed to providing life-saving forecasts in the face of these storms and ensuring that Americans are prepared and ready ahead of time," explained NOAA Acting Administrator Kathryn Sullivan. "As we saw first-hand with Sandy, it's important to remember that tropical storm and hurricane impacts are not limited to the coastline. Strong winds, torrential rain, flooding and tornadoes often threaten inland areas far from where the storm first makes landfall." · A continuation of the atmospheric climate pattern, including a strong West African monsoon, that is responsible for the ongoing era of high activity for Atlantic hurricanes, which began in 1995. · Warmer than average water temperatures in the tropical Atlantic Ocean and Caribbean Sea. · El Niño is not expected to develop and suppress hurricane formation. "This year, oceanic and atmospheric conditions in the Atlantic basin are expected to produce more and stronger hurricanes," said CPC Lead Seasonal Hurricane Forecaster Gerry Bell. "These conditions include weaker wind shear, warmer Atlantic waters and conducive winds patterns coming from Africa." Monitor major HF hurricane networks during events this season, which is predicted to be active to extremely active (see story above). The Hurricane Watch Net (HWN) on 14.325 MHz is one of several key players. It serves the Atlantic, Caribbean and Gulf of Mexico regions and activates when a storm is within 300 miles of land, coordinating with the National Hurricane Center (NHC) in Miami. Frequent, detailed information is issued on nets when storms pose a threat to the US mainland. In addition to hurricane spotting, local communicators may announce that residents have evacuated from low-lying flood areas. Other amateurs across the country can help by relaying information, keeping the net frequency clear and by listening. See the HWN's website for more information. 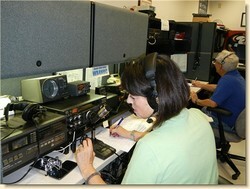 The net works closely with WX4NHC, the Amateur Radio station at the NHC. The SATERN Net (Salvation Army Team Emergency Radio Network) provides emergency communication support to the Salvation Army and populations at large. They also handle health and welfare traffic. SATERN holds high profile nets on 20 meters (14.265 MHz) during major hurricanes and has a long history of excellence, discipline and service. Refer to the SATERN website for more information. The VoIP SKYWARN and Hurricane Net operates by combining both the EchoLink and IRLP linked repeater networks, while handling critical wide area communications during major severe weather and tropical events. These operations have gained national stature in recent years and are a critical partner with WX4NHC. Whenever tropical weather is imposing a threat to the US mainland and certain other areas of interest, the VoIP WX net will be fully operational. See the VoIP SKYWARN website for more information. ARRL Emergency Preparedness Manager Mike Corey, KI1U, added that when ARES activates in response to any tropical event, it is crucial that information flows up through the ARRL Section and is reported to ARRL Headquarters. "These reports allow us to develop the situational awareness and disaster intelligence that is required for us as an organization to support the Sections that are impacted," he explained. "In this way, we are able to respond to relevant requests from the media and finally to coordinate with the governmental and non-governmental organizations. This information also allows us to make the decision at Headquarters on whether to activate the ARRL HQ Emergency Response Team to support and coordinate the operations." I recently loaded the software for RMS Express/WINMOR and managed to send an e-mail message to myself via the Telnet mode, and have moved on to adjusting the sound card and software for transmitting e-mail messages over the air on the HF bands. WINMOR is a sound card mode that is a less expensive alternative to the hard multi-mode data controllers while admittedly sacrificing some efficiencies. The RMS Express/WINMOR combo sees a lot of use in disaster response communications planning and operations.